Today (18th October), the Essex County Standard posted an item on their web-site titled ‘£500,000 revamp for Lion Walk’. Red Lion Yard is the pedestrian shopping arcade leading from the High Street to the Lion Walk shopping precinct, the first part of which is the carriageway within the historic Red Lion Hotel, and it is the Yard which is to be revamped. Apparently the Red Lion Hotel has been acquired by new proprietors only this month. The revamp plans were submited to Colchester Borough Council this week. The plans are to alter some of the shops and shopfronts, and to incorporate a trail about the history of Colchester in the arcade’s paving. There’s a lot of history to incorporate! The main block of the magnificent Red Lion Hotel was built in 1481-2 by the first Duke of Norfolk, as his town-house in Colchester. He was a key supporter of King Richard III during the Wars of the Roses. The land behind the building belonged to the Duke and, later, to the Red Lion Inn. The historic carriageway and Red Lion Yard led to Lion Walk, an ancient street which crossed Culver Street and extended south to the junction with Eld Lane at the Roman town wall; Lion Walk would have been the access from the inn to and defined the boundary of its land. The name of Lion Walk was first recorded in 1748; before that it was called Cat Lane, a name which was first recorded in 1357. The Trust conducted large excavations on the site of the Lion Walk shopping precinct between 1971 and 1974, after the destruction of the original streets and buildings and ahead of the construction of the new precinct. A huge amount of archaeological evidence was recorded, including the early Roman fortress and its outer defences, the streets and buildings of the later Roman town, an Anglo-Saxon hut, and post-Roman buildings, one of which was a 12th-century stone house. The remarkable finds included parts of two Roman mosaic floors (one depicting a walking lion); a Roman military buckle; a wooden bed and some bedding, and also some dates, all burned during the razing of Roman Colchester in the Boudican revolt; and a medieval lime kiln. A couple of years ago, when the Lion Walk shopping precinct was redesigned, a replica of the ‘walking lion’ mosaic was installed on the wall near the Lion Walk church spire – and this was made by Trust volunteers! This mosaic was made by our volunteers because of the success of our circus mosaic, which had been made by Trust volunteers and local schoolchildren; this is now in the garden of Roman Circus House (the circus centre). 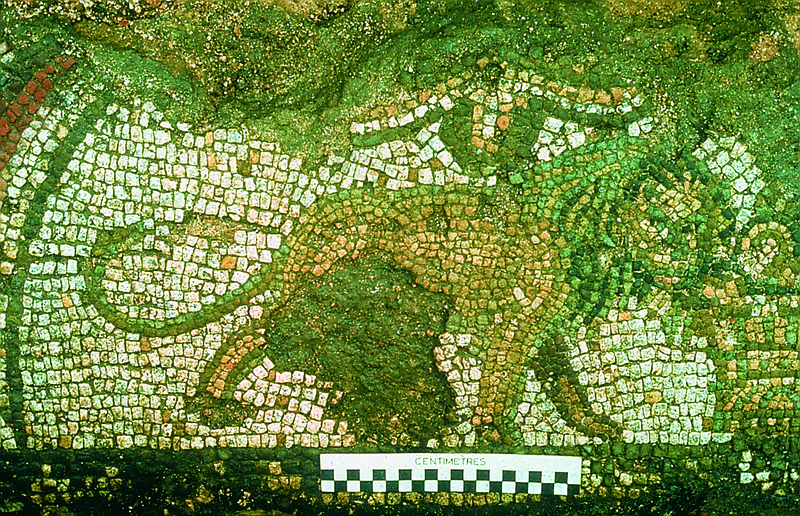 The image shows the Roman ‘walking lion’ mosaic, as excavated and as illustrated in City of Victory: the story of Colchester – Britain’s first Roman town.